Region 17 is pleased to offer a $1,000 educational scholarship to a woman studying in a music-related field. 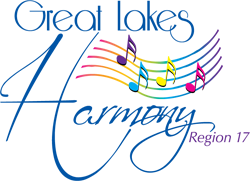 The recipient must be a member of Region 17 SAI or have a relative who is a current member or chorus director of Region 17, Sweet Adelines International. The award is administered through our Regional Management Team who reviews all applications, evaluates candidates using established selection criteria and selects the recipient. The award is presented during the Annual Spring Convention weekend. If no applications are received by that date, no scholarship will be awarded.